Review : This was JUST what I needed! I Couldn't find a reasonably-priced solution for my stereo problems for a couple of years, but then I found the listing for this product and it works great!! I recommend it to anybody with similar issues... Now I can listen to my record albums again! Review : I am happy with this equipment that i purchased especially for the price. Handles all my needs fairly! Review : Wanted to revive my old turntable and vinyl records so needed a preamp to boost signal to a new receiver (new ones mostly do not have 'phono' input. This one is inexpensive, simple to set up, and works fine. Review : Item works nicely, solidly constructed. Review : I needed a preamp to hookup my turntable. I saw this amp online at the Walmart site. I was greatly surprised that an inexpensive device would work so well. Easy to hookup and worked right out of the box. I would highly recommend this preamp if you want to hookup a turntable to a newer amp/tuner. Review : My Optimus turntable has a magnetic cartridge with no built in pre-amp so the simple plug-ins and small size made this an excellent way to connect my turntable to my amplifier achieving the gain that I needed. Review : Hey, A full year warranty on such a low price unit..Great. Love the compact profile,and even has an l.e.d. lamp !!! Review : Economical price and packaging. Easy to hook-up and sounds good! Review : Great product so far. Satisfied with the quality and sound. Great for the price! Review : Looked around, this one was simple to use plus best price around. Review : Simple to install, worked instantly, listening to my albums now!!! Review : Works great out of the box. Can finally ditch the monstrous receiver for this tiny preamp that sounds just as good! Review : Works great. Easy to hook up. Review : Small and easy to operate. Converted the phono signal from my old turnable to great sound through the aux port on my stereo. Review : Just needed a small preamp to go with a new receiver that lacked phono hookups. Searched online and found this little gem. works perfectly, and it's small form factor makes it easy to hide. Review : Great buy for the money. Works as advertised and easy to install. Review : works as advertised. easy hookup. Review : I have a Turntable that has both digital and analog hook-ups. I was hooking it up to my stereo receiver and found it was lacking in sound and power. This pre-amp solved the problem effectively and inexpensively. Review : OK but would like a little more volume. Review : Another petite giant. Delivers more than promised. Review : Fantastic! Inexpensive and makes my older Harman Kardon HK720 work with my Sony soundbar system. Review : After reading about product failing for a person that left it plugged in I decided to run dedicated power to the PP444 so that it is only plugged in when in use. It works flawlessly as advertised! 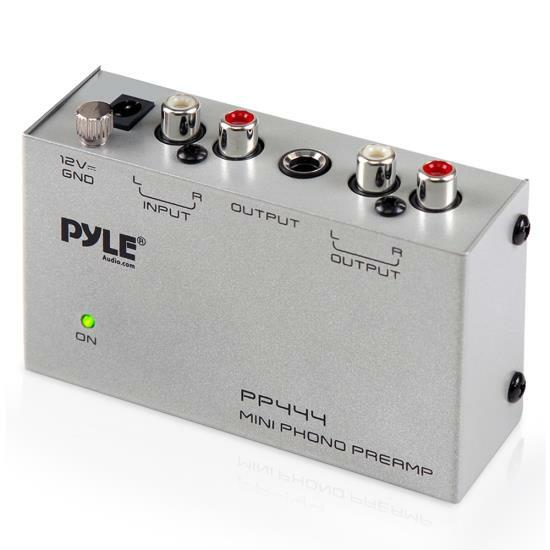 Review : The PP444 Mini Phono Preamp is a great little setup and does exactly what it's intended to do! The compact size fits where it needs to and it doesn't sacrifice any quality. Review : I purchased my Yamaha stereo during that period in the 90's when few amps and receivers had phono capabilities. For awhile now, I've had to listen to my records in my basement on an old Pioneer, which is nice, but I've always wanted to hear my music in my living room. While replacing my stylus at a well reputed stereo shop here in Seattle, I saw the PP444 on the shelf. After doing some research and reading reviews, I decided to give this unit a try. I couldn't be happier. My turntable now works with all my other components... everything, including my HDTV, comes out of the Yamaha stereo. I'm in audio heaven. Time to invite some friends over for music night. The unit is well built with a small metal case and solid connectors; even the ground is a sturdy brass screw. There is an unobtrusive green indicator light to let you know the unit is operating. The compact size of the unit allows me to put it conveniently out of the way. From my perspective, the sound is great (though I don't much care for the sound quality of MP3s, I'm not much of an audiophile). Amazon's price was great, too: More than half of the price charged by the stereo shop. I wanted to buy local but hey, Amazon is local for me. I ordered this Saturday night. With the two day shipping for Prime customers, this was on my doorstep at Noon on Tuesday. With Amazon's return policy, this was a no-brainer, worry free investment. So glad to have stumbled across this in the first place!! NOTE: You will need separate (not included) RCA cables to connect this unit to your stereo. If your turntable doesn't have cables, you'll need a second set to connect it to the preamp. Review : Excellent performance. Now I am able to use my vintage phono with my home theater. Review : So you bought that nice new surround capable stereo amp and you can plug almost everything into it you can imagine. Except for your Turntable! Thanks to this product, your Vinyl can once again rule in a modern digital world. Easy to set up and compact in design so as not to be in the way. Review : Does a great job for a small pre-amp. Review : Great working preamp. I have a phono input on my receiver but the sound quality is poor. I need to use an equalizer to get the low, mid and high frequencies that my receiver lacks. Hooked the PylePro PP444 preamp to my equalizer, using line in jacks instead of the phono in jacks and now all my vinyl records sound great. Unit is small enough to hide behind any component. Very clean sound with no hum. Accepts ground wire from turntable. Highly recommend. Review : This product is great! Iwould not be able to listen to my vinyl without this preamp PP444. My turntable sounds great thanks.